The German secret service BfV warns against fake profiles on LinkedIn that would be used by Chinese intelligence services to gather information about politicians and policymakers. Over a period of nine months more than 10,000 Germans were approached via the fake profiles, according to the BfV. 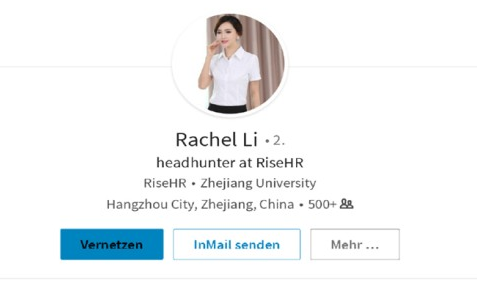 The profiles occur as headhunters, consultants or scientists with the names "Rachel Li" and "Alex Li". They claim to have, among other things, vacancies at a Dutch HR company. After contact has been made, the fake profiles try to collect information about habits, hobbies and political interests. "Chinese intelligence services are active on networks such as LinkedIn and in this way try to gather information and find sources of information," said a spokesperson. Many of the profiles are provided with photographs of attractive men and women. One of the photos would even be taken directly from an online fashion catalog, according to Reuters . The fake profiles have mainly provided for European diplomats and politicians. German citizens are called upon to report suspicious profiles and not to share valuable personal information via social media. "This is an extensive attempt to infiltrate certain parliaments, ministries and government agencies," says Hans-Georg Maassen, head of the BfV.